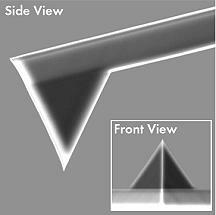 NanoWorld Arrow™ CONTPt AFM probes are designed for Contact Mode imaging. Furthermore this type can be used for Force Distance Spectroscopy Mode or Pulsed Force Mode (PFM). The CONT type is optimized for high sensitivity due to a low Force Constant. Additionally, this probe offers a tip radius of curvature of less than 25 nm.